← Trump’s Dual Narrative — Promoting Foreign Policy and National Security Chaos? Trump’s War on the WTO — Not Enough Wins? — Yes and More. What is the Trump war on the WTO and its dispute resolution system all about? Sour grapes for not getting 100% wins? Personal animosity by the new USTR because of his failures in private practice? Trump’s abuse of domestic courts as a real estate developer – he’s been involved in over 3,500 private law suits? It’s hard to say. Probably a bit of each of the above. But what can be said with certainty is this — the current U.S. anti-WTO policy is a critical part of Trump’s disdain for international institutions that try to negotiate and apply rules of law to international relations and international transactions. Trump shows no appreciation or understanding the crucial role the United States played in formulating the post-war global institutions nor the great strides made in channeling highly politicized trade disputes into a regularized system of settling disputes outside of the gaze of harsh domestic interests and rabble rousers. More than anything else the WTO’s dispute resolution system was an American creation and we were the principal architect of bringing law to global trade and to have commercial issues adjudicated as being in our national interest. That system has prospered over the last twenty years. The U.S. is the largest user of the WTO’s dispute resolution system. We win most cases brought as a complaining party. We also win a large number of the cases brought against us. The system is used widely by countries across the world. What’s my conclusion? 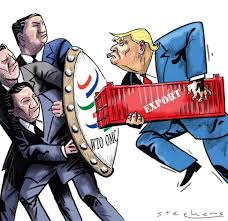 The Trump – Lighthizer foreign trade policy opposing the WTO and its dispute resolution system is against our national interest and the interest of the global trading system. They must rise above their personal and business biases for the good of the United States. “USTR before the Center for Strategic and International Studies — Different Trade Philosophy, Problems with the WTO.DSU and on China Mercantilism.” CSIS (Sept. 18, 2017). “Trump’s Speech to UN General Assembly (Sovereignty and Trade).” White House (Sept. 19, 2017) and NYT (Sept. 20, 2017). “WTO Held Hostage by the U.S.” The Economist (Sept. 23, 2017). “WTO Chief Warns of Risks to Trade Peace.” Financial Times (October 2, 2017). 1 Response to Trump’s War on the WTO — Not Enough Wins? — Yes and More.